6-Shogaol is a constituent of ginger that imparts the pungent flavor and a hydrolysis product of gingerols. This study aimed to investigate the potential of 6-shogaol as a natural cosmetic raw material by examining its anti-apoptotic, antioxidant, and anti-aging effects in human dermal fibroblasts (HDFs). Cell cycle analysis, ApoAlert caspase-3 colorimetric assay, and qRT-PCR analysis to assess the anti-apoptotic effects and qRT-PCR to measure the expression of SOD, CAT, and NRF2 to assess the antioxidant effects of 6-shogaol were performed; dichlorofluorescein diacetate was used to measure reactive oxygen species (ROS). Anti-aging effects were examined using qRT-PCR analysis to measure the expression of COL1A1 and MMP1 as well as using an SA-beta Gal assay. 6-Shogaol showed no toxicity in HDFs at concentrations 5, 10, and 20 μM, and increased cell viability in a dose-dependent manner. qRT-PCR analysis showed that 6-shogaol pre-treatment downregulated the expression of BAX, caspase 3, and caspase 9 in a dose-dependent manner. Sub-G1 cells, which are rarely found in the normal cell cycle, decreased in a concentration-dependent manner after 6-shogaol pre-treatment, and treatment ameliorated the ROS increase observed upon UVA (10 J/cm2) irradiation of HDFs and the expression of NRF2 increased in a dose-dependent manner. In addition, the expression of SOD and CAT, which are typical cellular antioxidant enzymes, increased. 6-Shogaol also increased the expression of COL1A1, the gene type 1 collagen in HDFs, and decreased the expression of MMP1, which codes for an enzyme that degrades type 1 collagen, thus promoting collagen formation. These results suggest that 6-shogaol can be used as a cosmetic material for preventing skin aging because of the cytoprotective, anti-apoptotic, and antioxidant effects in the HDFs identified in this study. Ultraviolet rays are one of the most common causes of extrinsic aging and can be divided into UVA, UVB, and UVC depending on their wavelength. UVA, which has a relatively long wavelength range at 320–400 nm, has a lower energy level than UVB but is 20 times more abundant on the earth’s surface because it is not easily absorbed in the atmosphere; it can also penetrate the dermal layer (Kim et al. 2011; Piao et al. 2013). Persistent exposure to UVA causes oxidative stress to dermal fibroblasts and damage to DNA, lipids, and proteins, ultimately leading to skin aging (Yoon et al. 2013; Cha and Kim 2015). Ginger (Zingiber officinale), which has been used since a long time for its unique pungent flavor and aroma, is also known for its anti-inflammatory, antioxidant, antithrombotic, anti-cancer, and anti-arthritic properties (Kim et al. 2008; Ling et al. 2010). Its major chemical constituents are gingerols, shogaols, and paradols. Gingerols are the most abundant molecules in fresh ginger, and their hydrolysis products are shogaols (Bak et al. 2012; Huang et al. 2014). 6-Shogaol, one of the constituents responsible for its pungent flavor, has attracted interest because of its potential uses in the medical and food fields due to its anti-cancer, anti-inflammation, antioxidant, and antibacterial properties. However, there have been no studies on the effects of 6-shogaol in human dermal fibroblasts (HDFs) with respect to its possible use in cosmetics. Furthermore, because of the current aging population and a growing interest in maintaining a friendly environment and safety of raw materials for cosmetics, there is an urgent need to safely develop natural cosmetic raw materials with excellent anti-aging properties. Therefore, this study sought to investigate the potential of 6-shogaol as a natural cosmetic raw material by examining its possible anti-apoptotic, antioxidant, and anti-aging effects in HDFs. HDFs (Lonza, Switzerland) were cultured in Dulbecco’s modified Eagle medium (HyClone™, GE Healthcare Life Sciences, UK) containing 10% fetal bovine serum (HyClone™) and 1% antibiotics (penicillin 100 IU/mL, streptomycin 100 μg/mL; Invitrogen™, Thermo Fisher Scientific). Cells were cultured at 37 °C and in an atmosphere of 5% CO2. 6-Shogaol was purchased in a powder form (> 90% purity) from Sigma-Aldrich Inc. (St. Louis, MO, USA) and dissolved in dimethyl sulfoxide (Sigma-Aldrich). UVA irradiation was performed using a UV-A lamp (UVP, USA) at a dose of 10 J/cm2, based on a previous study (Lee et al. 2017). The water-soluble tetrazolium salt (WST-1) assay was used to assess cell viability. After seeding HDFs in 100 μL at a density of 3 × 103 cells/well in a 96-well plate and culturing for 24 h, 6-shogaol was added at the indicated concentrations, followed by UVA irradiation. 10 μL of EZ-Cytox cell viability assay kit reagent (ItsBio, Seoul, Korea) was then added, and the plate was incubated for 1 h prior to reading absorbance in a microplate reader (Bio-Rad, Hercules, CA, USA) at 490 nm. Cell cycle was analyzed by measuring the cell population in sub G1, G1, S, and G2/M phases using a BD FACSCalibur™ flow cytometer (BD Biosciences, San Jose, CA, USA). Cells were seeded into 60-mm culture dishes at 2 × 105 cells/dish, incubated for 24 h, and then pre-treated with 6-shogaol (5, 10, 20 μM) for 6 h. After UVA irradiation, cells were incubated for 24 h and then harvested and centrifuged at 5000 rpm for 5 min at 4 °C. The supernatant was removed, and 300 μL of phosphate-buffered saline (PBS) was added to resuspend the cell pellet. Absolute ethanol (700 μL) was then gradually added while vortexing. The cells were then fixed by incubating at 4 °C for at least 3 h, after which 1 mL PBS was added. After centrifugation at 5000 rpm for 5 min at 4 °C, the supernatant was removed and the cells were resuspended in 200 μL of propidium iodide (PI) staining buffer (Sigma-Aldrich) and incubated at 37 °C for 1 h.
RNA was extracted using Trizol reagent (Invitrogen/Life Technologies), following the manufacturer’s instructions. After addition of 0.2 mL of chloroform (Biopure, Tulln, Austria) and centrifugation for 20 min at 12000 rpm and 4 °C, 0.5 mL of isopropanol (Biopure) was added to the supernatant, and the sample was incubated at room temperature for 10 min. The sample was then centrifuged at 12000 rpm and 4 °C, and the RNA pellet was washed with 75% ethanol and dried at room temperature. RNA was then dissolved in diethylpyrocarbonate (DEPC; Biopure) in water. A Nanodrop spectrophotometer (MaestroGen, Taiwan) was used to measure OD 260/280 nm, and only RNAs with a value > 1.8 were used. Ten microliters of 1 μg RNA, 0.5 ng oligo dT18, and DEPC water in a PCR tube was incubated at 70 °C for 10 min to induce RNA denaturation, and this sample was then reverse-transcribed by adding M-MLV reverse transcriptase (Enzynomics, Dajeon, Korea) and incubating for 1 h at 37 °C. PCR was validated via a melting curve analysis, and the expression of each gene of interest was compared after standardization with respect to the expression of β-actin. All primers used are listed in Table 1. Cell senescence was assessed using a senescence-associated β-galactosidase assay (BioVision, Milpitas, CA, USA). HDFs were seeded into 60-mm dishes at 2 × 105 cells/dish, cultured for 24 h, and pre-treated with 6-shogaol at 5, 10, and 20 μM for 6 h. After UVA irradiation, the cells were incubated for a further 24 h. Cells were then removed from the medium, washed with 1 mL of PBS, and fixed with 0.5 mL of a fixing solution at room temperature for 15 min. The fixed cells were incubated in 0.5 mL of staining mixture containing 470 μL staining solution, 5 μL staining supplement, and 25 μL X-gal in dimethylformamide (DMF; 20 mg/mL) at 37 °C for 24 h. Cells were washed with PBS, and the ratio of the number of stained cells to the total was determined by examination using an optical microscope (Olympus, Tokyo, Japan). Dichlorofluorescein diacetate (DCF-DA) was used to measure intracellular reactive oxygen species (ROS) concentrations. HDFs were seeded on 60-mm dishes at 2 × 105 cells/dish and cultured for 24 h before pre-treatment with 6-shogaol at 5, 10, and 20 μM for 6 h. After UVA irradiation, the cells were incubated for 24 h. DCF-DA (10 μM) was added and incubated for 30 min. After washing with PBS, cells were released and analyzed by flow cytometry (BD Biosciences) to measure ROS levels. l-ascorbic acid (20 μM), which is a ROS scavenger, was used as a positive control and was measured in the same manner to compare the efficacy of ROS removal. The ApoAlert™ caspase-3 colorimetric assay kit (Clontech, USA) was used to assess expression of caspase 3 and caspase 9. HDFs pre-treated with 6-shogaol at the indicated concentrations were isolated and resuspended in chilled cell lysis buffer, incubated on ice for 10 min, and centrifuged at 15,000 rpm for 3 min at 4 °C. The supernatant was added to a 96-well plate containing ApoAlert™ reaction buffer, and the plate was incubated at 37 °C for 30 min. Caspase substrate was then added before incubation for 1 h at 37 °C and measurement of absorbance at 405 nm using a microplate reader (Bio-Rad). All experiments were separately performed more than three times. Student’s t test was used to compare the treatments, and a p value < 0.05 was considered significant. HDFs were treated with 5, 10, 20, 40, and 80 μM 6-shogaol for 6 h and examined using the WST-1 assay to estimate cytotoxicity. There was little effect on viability at 5–40 μM, although a decrease was observed at 80 μM. These results suggest that 6-shogaol is not cytotoxic at concentrations ≤ 40 μM (Fig. 1a). 10 J/cm2 UVA irradiation reduced HDF cell viability to 67% compared with non-irradiated control. However, 6-shogaol at concentrations of 5, 10, and 20 μM increased cell viability to 78%, 82%, and 87%, respectively. The cell viability was increased by 6-shogaol pre-treatment in a concentration-dependent manner (Fig. 1b). The sub-G1 population of UVA-damaged HDFs increased from 2.1 to 17.9%, but 6-shogaol at concentrations of 5, 10, and 20 μM reduced this to 14.2%, 9.6%, and 3.4%, respectively (Fig. 2a). The increase in the number of cells in sub-G1 phase, which is rarely observed in the normal cell cycle, is indicative of increased cell cycle arrest and apoptosis. Bax is the pro-apoptotic cytoplasmic protein, and its expression was indirectly measured using qRT-PCR. UVA (10 J/cm2) increased BAX mRNA expression from 0.37 fold to 1 fold. However, 6-shogaol treatment at 5, 10, and 20 μM reduced BAX mRNA expression to 0.84 fold, 0.51 fold, and 0.47 fold, respectively (Fig. 2b; Han et al. 2008). Expression of caspase 3 and caspase 9, which are proteases involved in apoptosis, was also indirectly measured by qRT-PCR. 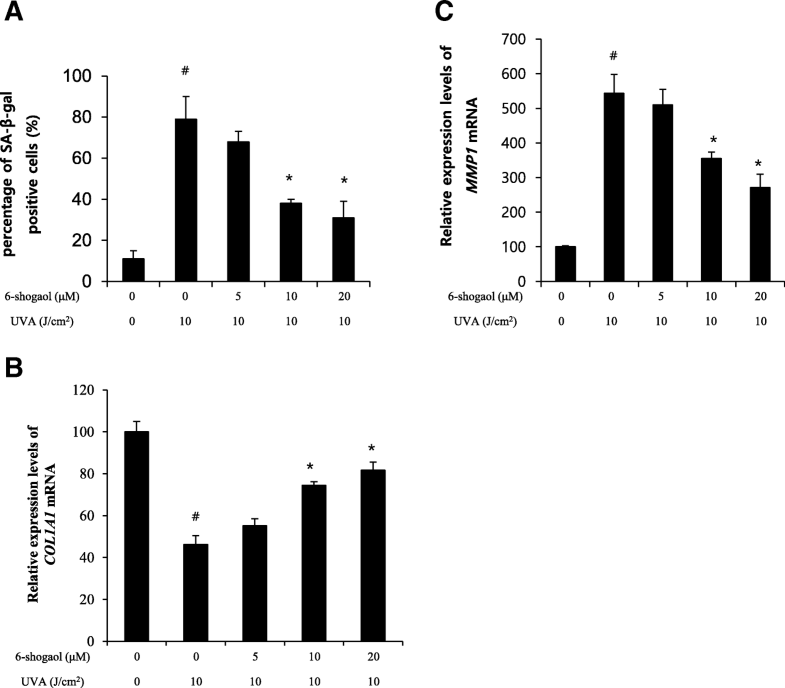 Caspases 3 and 9 mRNA increased from 1 fold to 2.2 fold and 1.9 fold, respectively, upon 10 J/cm2 UVA irradiation, but 6-shogaol at 5, 10, and 20 μM reduced this to 2 fold, 1.6 fold, and 1.4 fold for caspase 3 and 1.8 fold, 1.3 fold, and 1.1 fold for caspase 9, respectively (Fig. 2c; Li et al. 1997). UVA-irradiated HDFs exhibited an increase in DCF fluorescence intensity, whereas cells pre-treated with 5, 10, and 20 μM 6-shogaol exhibited a significantly reduced DCF intensity of 125%, 79%, and 61%, respectively. At 20 μM, 6-shogaol exhibited a similar radical scavenging ability as that obtained with the same concentration of l-ascorbic acid (69%), the positive control (Fig. 3a). SOD and CAT encode representative antioxidant enzymes that reduce oxidative stress, and their expression was assessed by qRT-PCR. 10 J/cm2 UVA irradiation reduced SOD expression from 100 to 55%. Treatment with 6-shogaol at 5, 10, and 20 μM reduced SOD expression to 61%, 77%, and 81%, respectively (Fig. 3b). Similarly, 10 J/cm2 UVA irradiation reduced CAT expression from 100 to 74%, whereas treatment with 6-shogaol at 5, 10, and 20 μM reduced CAT expression to 80%, 93%, and 90%, respectively (Fig. 3c). NRF2 is a transcription factor that regulates the expression of antioxidant enzymes in response to oxidative stress. 10 J/cm2 UVA irradiation reduced NRF2 expression from 100 to 53%. In the presence of 6-shogaol, the reduction was only 63% at 5 μM, whereas there was an increase to 114% and 179%, respectively, at 10 and 20 μM (Fig. 3d). The senescence-associated β-galactosidase (SA-β-gal) assay was used to assess cellular senescence, and 10 J/cm2 UVA irradiation increased the expression ratio of SA-β-gal to 7.9 fold (79%) over control cells (10%). However, the ratio of SA-β-gal decreased in a concentration-dependent manner to 68% at 5 μM 6-shogaol, 38% at 10 μM 6-shogaol, and 31% at 20 μM 6-shogaol, indicating that 6-shogaol can suppress cellular senescence induced by UVA irradiation (Fig. 4a). Expression of COL1A1 mRNA, a member of group I collagen which include COL1A1 and COL1A2, decreased from 100 to 46% upon 10 J/cm2 UVA irradiation, but in treatment with 6-shogaol at 5, 10, and 20 μM, the reduction was only 55%, 74%, and 81%, respectively (Dalgleish 1997; Fig. 4b). In contrast, the expression of MMP1, a gene that codes for an enzyme that degrades type I collagen, prominently increased from 100 to 543% upon 10 J/cm2 UVA irradiation, but treatment with 6-shogaol at 5, 10, and 20 μM reduced these levels to 510%, 355%, and 271%, respectively (Fig. 4c). Genes associated with apoptosis are divided into two main groups: anti-apoptotic and pro-apoptotic. Anti-apoptotic proteins such as Bcl-2 and Bcl-xL suppress apoptosis, whereas pro-apoptotic proteins such as Bax and Bak promote apoptosis (Han et al. 2008; Li et al. 1997). Under normal conditions, both pro-apoptotic and anti-apoptotic proteins are kept in balance in the form of dimers in the mitochondria. When the balance between them is disturbed by stimulation, such as by ultraviolet irradiation or oxidative stress, cytochrome c is released from the mitochondria into the cytoplasm, which in turn activates caspase 9 and caspase 3. Caspase 3 is directly activated by caspase 9 and then cleaves poly ADP-Ribose polymerase (a gene repair enzyme) and induces cell apoptosis (Kang et al. 2011). 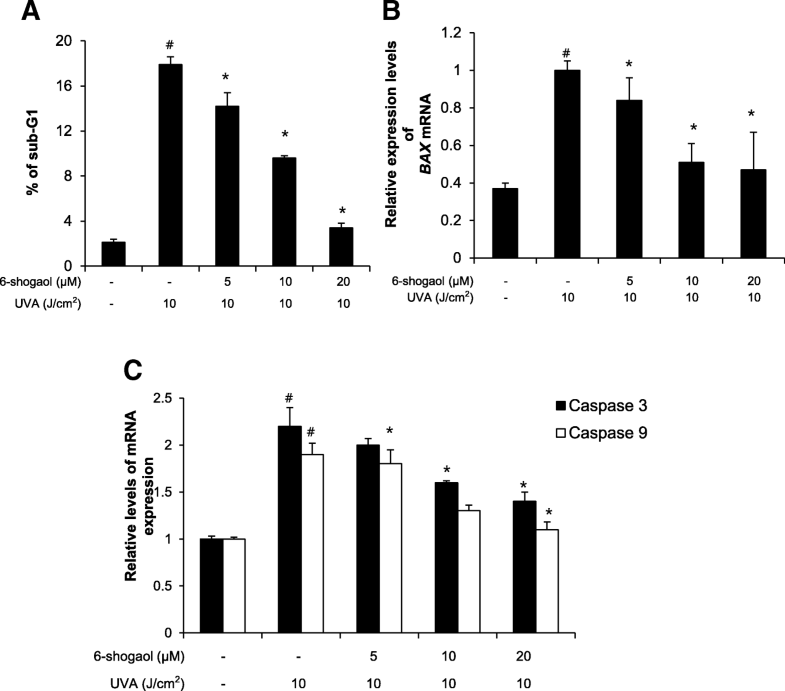 This study showed that 6-shogaol attenuates UVA-induced cell apoptosis through the downregulation of the apoptosis-related Bax, caspase 9, and caspase 3. In addition, the UVA-induced increase in the number of cells in sub-G1 phase, which is rare in a normal cell cycle, was reduced in a concentration-dependent manner after pre-treatment with 6-shogaol. Taken together, these data indicated that 6-shogaol has anti-apoptotic effects on HDFs. UVA penetrates HDFs and induces ROS production, thereby destroying the balance of the skin’s antioxidant defense system and damaging normal skin cells. These ROS are produced by the inflammation reaction of prostaglandins (PGs) biosynthesis and the metabolism of mitochondria-like organelles in normal cells (Okon and Zou 2015). However, most ROS are removed by antioxidant enzymes such as those encoded by GPX, CAT, and SOD or by antioxidants such as ubiquinone, vitamin E, and vitamin C (Shindo et al. 1994; Urso and Clarkson 2003). Nrf2 is a transcription factor that regulates the expression of antioxidant enzymes in response to oxidative stress, such as those encoded by SOD, GPX, and CAT. SOD encodes for superoxide dismutase, a typical antioxidant enzyme that reduces oxidative stress by converting superoxide into hydrogen peroxide (Slater 1984; Zelko et al. 2002). CAT encodes catalase, which converts the H2O2 produced by SOD to H2O and O2 (Dickinson and Forman 2002). In this way, the antioxidant enzymes protect membrane and cytosolic components against cell damage caused by UV (Okon and Zou 2015). This study showed that 6-shogaol increases the expression of SOD and CAT mRNAs in a dose-dependent manner through the upregulation of NRF2 mRNA, thus upregulating the expression of antioxidant enzymes in response to oxidative stress. In addition, the elevation of ROS induced by UVA irradiation was ameliorated in a concentration-dependent manner by pre-treatment with 6-shogaol. Taken together, these data demonstrated that 6-shogaol can inhibit oxidation in HDFs. Collagen, the most abundant protein in humans, is represented by 28 types. The most common ones present in the dermis are collagen type I comprising 80–85% and type III comprising 15–20% (Dalgleish 1997; Stewart et al. 2006). Collagen is synthesized in the skin by fibroblasts, and the genes responsible for the production of collagen type I are COL1A1, which is located on chromosome 17 and encodes the α1(I) chain, and COL1A2, which is located on chromosome 7 and encodes the α2(I) chain. Type I collagen is considered to be the mature form and consists of a heterotrimer composed of two identical chains α1 (I) and one α2 (I); this protein is primarily responsible for the mechanical strength of tissues (Huerre et al. 1982; Stadelmann et al. 1998; Furth 1991). Matrix metalloproteases (MMPs) play a role in the degradation of collagen, particularly in aging skin. MMP-1 is known to be a main factor in age-associated diseases, including photo-induced skin wrinkling, and is highly associated with stress-induced premature senescence (Lee et al. 2012; Pittapruek et al. 2016). Therefore, MMP-1 is a biomarker of photoaging because its expression is responsible for extracellular matrix degradation in skin (Martin et al. 1990). In this study, pre-treatment with 6-shogaol inhibited MMP-1 mRNA expression and increased COL1A1 mRNA expression, suggesting that it has anti-aging effects. This study investigated the potential of 6-shogaol as a natural cosmetic raw material by examining its anti-apoptotic, antioxidant, and anti-aging effects in HDFs. First, the number of cells in the sub-G1 phase, which is rarely found in the normal cell cycle, decreased in a concentration-dependent manner after 6-shogaol pre-treatment. 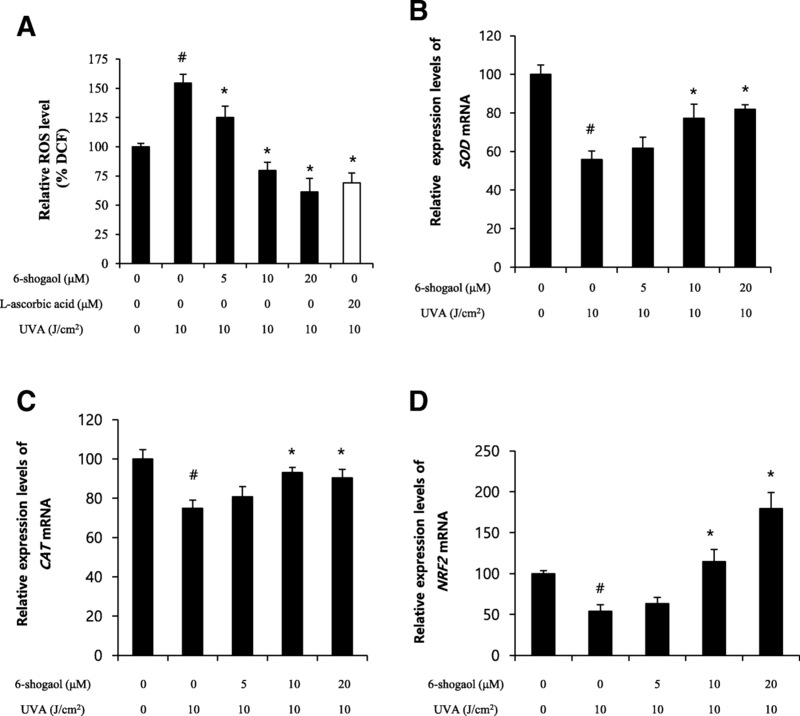 Pro-apoptotic caspases 3 and 9 as well as the pro-apoptotic protein Bax decreased in a dose-dependent manner upon 6-shogaol treatment. This suggests that 6-shogaol inhibits the UVA-induced apoptosis of HDFs. Second, ROS increased upon UVA irritation of HDFs was reduced by 6-shogaol in conjunction with increased expression of NRF2, which is a transcription factor that controls the expression of antioxidant enzymes during oxidative stress. In addition, the expression of SOD and CAT, which encode for typical antioxidant enzymes, was increased. These results indicate that 6-shogaol inhibits oxidation of HDFs induced by UVA. Third, 6-shogaol increased the expression of COL1A1, which produces type 1 collagen in HDFs, and decreased the expression of MMP1, an enzyme that degrades type 1 collagen; these effects promote collagen formation. In addition, a reduction in senescence of HDFs by 6-shogaol was observed. Consequently, these results suggest the possibility of 6-shogaol as a natural cosmetic raw material preventing skin aging, through identified functions on the anti-apoptotic, antioxidant, and anti-aging effects in HDFs reported here. There was no funding for this research article. HSH and SA designed the study. KBK, JHJ, and ISA did all of the research such as experiments, data collection, and statistical analysis. HSH and YJK wrote the draft of the manuscript. All authors read and approved the final manuscript. Sungkwan An is the co-Editor-in-Chief, In Sook An and Jin Hyuk Jung are the Managing Editors, and Hyo Sun Han is an Editor of Biomedical Dermatology.